Robb & Stucky’s Christine Neal has completed the preliminary design for the Collins model at Eleven Eleven Central. This rendering is an artist’s conception of the floor plan. The Ronto Group announced Robb & Stucky’s Christine Neal has completed the preliminary design for the interior of the furnished Collins model at Eleven Eleven Central, a new walkable/bikeable, access-controlled community to be built by the developer on Central Avenue between 10th Street and Goodlette- Frank Road in downtown Naples. Four Phase I furnished models, one of which is under contract, will showcase Ronto’s Collins, Duval and Belair floor plans and be available for viewing after completion of construction through a developer leaseback. Ronto’s Phase I offering at Eleven Eleven Central features five light-filled two-bedroom, two-bedroom plus den, and three-bedroom open-concept floor plans ranging from 1,407 to 2,297 square feet of total living space, including covered outdoor balconies. Two of the floor plans, the Atlantic and the Avalon that were originally priced starting in the mid-$500s, are sold out. Pre-construction pricing on the remaining unsold residences starts at $725,000. Phase I is more than 50 percent sold. Ronto is accepting purchase agreements for the remaining residences and anticipates beginning Phase I construction by the end of this year. Northern and southern facing Collins residences, base priced at $820,000, are available for purchase. The two bedroom plus den, two-and-a-half bath Collins floor plan includes a total of 1,947 total square feet of living space with 1,757 square feet under air. The living area opens to a covered balcony and includes a great room, dining area, and island kitchen. The owner’s suite features two walk-in closets, a bath with his and her vanities, and a bedroom with a sitting area. The Collins plan also includes a separate laundry room. 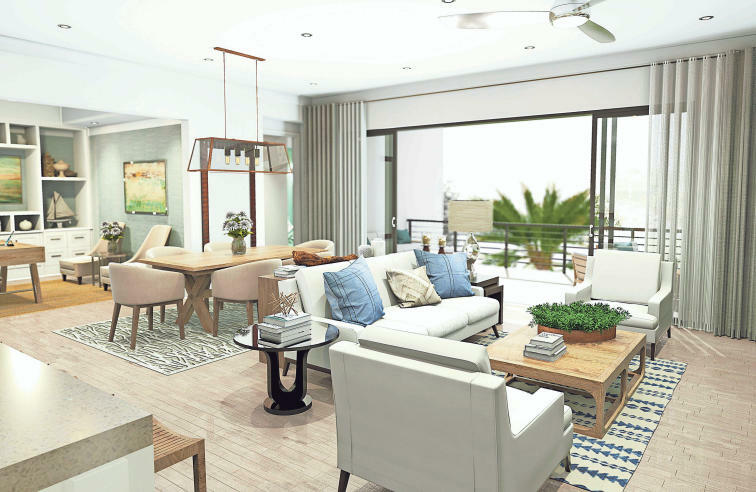 The Unit 312 Collins model designed by Neal overlooks Eleven Eleven Central’s resort- style courtyard amenity deck and is priced at $1,009,205 with furnishings. Neal’s inspiration for the Collins model is a merging of contemporary and modern elements that create a soothing vibe incorporating a calm color scheme reminiscent of Naples’ sandy beaches and spa-like seas. The wall tone in the living areas will be Shoji White with extra white trim and taupe and cool gray accents. Stone elements will bring a note of texture to the neutral palette. Flooring in the living areas will be strands-glazed porcelain white tile in a 12-by-24-inch format. Neal establishes her mix of contemporary and modern elements in the foyer. A contemporary polished stainless steel pendant lighting fixture reflects LED lights that cast a gold feeling that is modern, clean, and warm. The great room’s feature wall will be finished with a woven faux Capiz Shell wall covering with an appealing texture that combines colors to convey warmth and some sandiness to serve as a reminder of the beach. A hint of iridescence suggests the use of stone while the weave of the material presents the look of an organic fabric. A streamlined console table will be placed under a wall-mounted television and will feature a brushed nickel metal frame and a two-inch thick fusion glass top with a spa illusion in the glass. A pair of ottomans will be stowed under the console to provide additional seating when entertaining. Furnishings in the great room will include an oyster-toned Italian leather sectional sofa, a low-lounge swivel chair finished with a textural taupy gray fabric, a circular side table with a metal base, a cocktail table with a gray marble top and a metal base fashioned as a play on a Greek key, and an occasional table with a matching gray marble top and a stainless-steel base that provides a contemporary note against the more modern looking sectional sofa. The seating area is anchored by a spa-green shag area rug. Light draperies reminiscent of linen stationary panels flank the sliders that open the great room to the terrace. In the adjacent dining area, a rectangular frosted glass topped table with a metal base that will provide a touch of silver as well as unique angles that will lend a sense of dimension and definition to the dining space. Fabric covered dining chairs will present the same frame style and finish found on the four leather covered counter stools at the island in the kitchen. Neal incorporated glossy-white cabinetry with flat panel fronts throughout the kitchen that will be complimented by Celeste Viatera white marble counter surfaces. A glossy spa wave backsplash will be presented with glass subway tiles. The kitchen’s open design and island seating will offer an inviting space for both cooking and entertaining. To maintain the flow of the living area, the den will have an open entry. To create light and warmth in the den, Neal created a rear feature wall with two vertical stacks of faux mirrored windows against a textural suede cork simulated wall covering with silver highlights. The walls on either side of the space will be painted in a Mindful Gray tone that is a bit darker than the wall tone in the living area. A contemporary desk with a high gloss gray wood top will include an angled polished stainless-steel base that will unite the den with the furnishings found in the great room and dining area. A modern lounge chair’s textured fabric that will be gray and taupe against an oyster background will provide a bit of contrast to the smooth and shiny finishes found throughout the room. With its Aloof Gray wall tone, carpeting and Neal’s use of taupes and spa greens, the owner’s bedroom will offer a look of its own. A channeled headboard in a lightly textured taupe fabric will contribute a bit of dimension to the bed. The side rails and footboard will be finished in the same fabric. Nightstands with medium-toned wood tops and drawers will feature acrylic legs that will make the pieces appear as if they are floating. A dresser will be finished in the same medium-toned wood and will feature clean touch-latch drawers. A side chair will include a contemporary polished stainless-steel base and a modern fabric with striations of taupe, green, and spa green against an oyster background. The bedroom’s drapery panels will incorporate taupe and spa green that will convey a soft, airy, beach effect. The walls in the owner’s bath will be covered with wallpaper in a tone reminiscent of the varying colors of the Gulf of Mexico found throughout the day. The flooring will match the strands-glazed porcelain white tile found in the living areas. Separate vanities will feature dark-toned cabinetry with Verona Arabescato marble counter surfaces. Neal included a Mid-Century Modern low-slung oyster-toned Saarinen circular cocktail table on the long linear balcony. A smaller, taller circular table will sit next to and overlap the lower table to create a nesting effect. A pair of lounge chairs will feature angled bases that will connect the outdoor space to the interior spaces. Sunbrella chair cushions will be presented in a taupe tone.